Sometimes when we “redo” a website, we’re really just updating the look and maybe some organization of the content. Sometimes, we’re knocking the house down to the foundation and starting from scratch. This project fell into the later of those two categories. Mike Brewer approached us about redoing his instantmusicnow.com website for him. 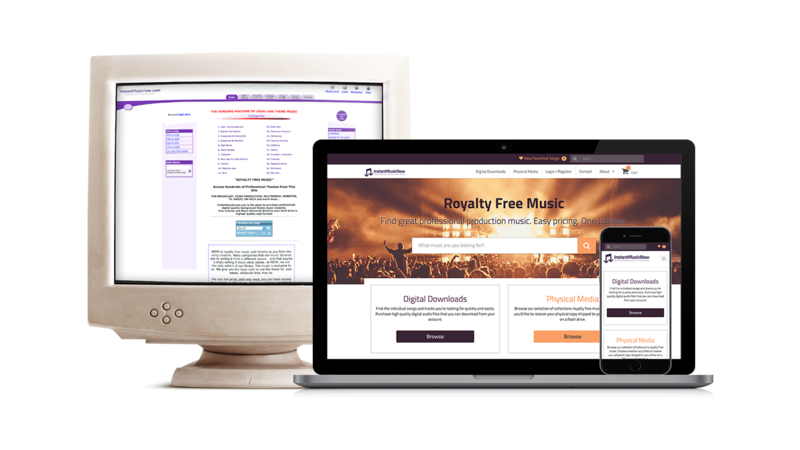 Mike was one of the pioneers on the web when it came to being able to find royalty free music for purchase on the web in the early 90s, making it easy for people to purchase CDs or MP3s for download. 20 years later though, the site was definitely showing it’s age not only in looks, but how it was constructed. We worked with Mike in redoing this that we balanced coming up with a redesign of the website that was more modern and easier to use, but also didn’t completely throw away everything he had before in the way of content and brand identity. We kept some of the purple elements, a lot of the content, and only did a small change on the logo itself. The main change was the presentation of the content. Being an e-commerce site, the songs for purchase needed to stand out in front of the rest of the site and not be hidden or undervalued by other content. The content became not only easier to find, but easier to manage on the content editing side of things as well. From a technical standpoint we moved the site to WordPress, using Woocommerce as the main e-commerce engine behind it. Woocommerce was great as it allowed us to leverage the capabilities and security within it, while also being able to heavily customize it so that Instant Music Now didn’t look like just another woo commerce site, but a site that was custom designed and built specifically for them.